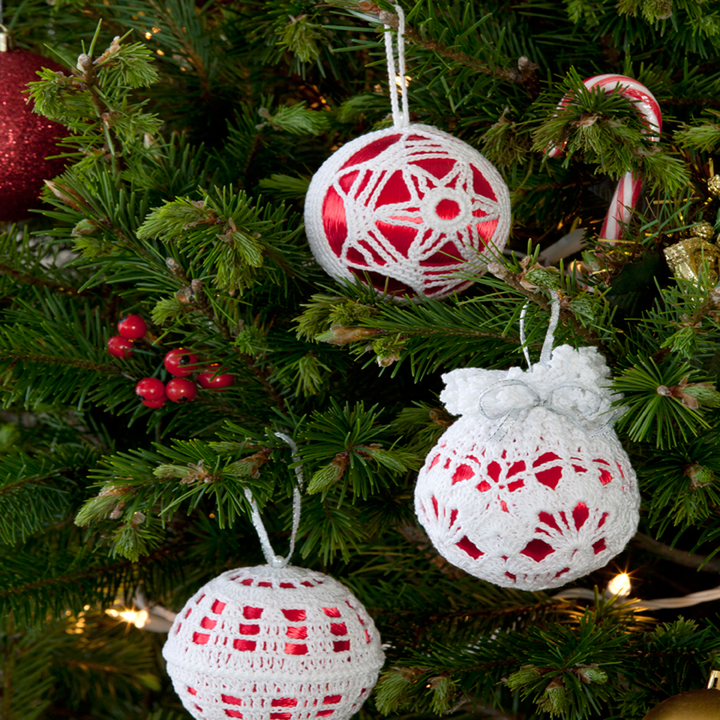 Make your Christmas tree or other decorating unique with these one-of-a-kind crochet thread ball decor. Amaze your friends and family. They make beautiful gifts. 1/8″ x 39″ double-faced satin ribbon; 2″ long pearl teardrop corsage pins; 3″ red satin balls. Steel Crochet Hook: 1.5mm [US 7]. Tapestry needle; 1/8” x 25” double-faced satin ribbon; 2” long pearl teardrop corsage pin; 3” red satin ball. Picot = ch 3, slip st in top of last st made. Ch 6; join with a slip st to form a ring. Round 1: Ch 5 (counts as dc, ch-2), [dc in ring, ch 2] 7 times; join with a slip st in 3rd ch of ch-5. Round 2: Slip st in next space, ch 5 (counts as dtr), 3 dtr in same space, ch 3, [4 dtr in next space, ch 3] 7 times; join with a slip st in top of ch-5. Round 3: Slip st in next dtr, [sc between 2nd and 3rd dtr, (4 dc, ch 2, 4 dc) in next ch-3 space] 8 times; join in first sc. Round 4: Slip st in next 4 dc and into ch-2 space, ch 5 (counts as dtr), (dtr, [ch 3, 2 dtr] 3 times) all in same space, * (4 dc, ch 2, 4 dc) in next ch-2 space **, ([2 dtr, ch 3] 3 times, 2 dtr) all in next ch-2 space; repeat from * around, end at **; join in top of ch-5. Round 5: Ch 1, * sc between next 2 dtr, (3 dc, [picot, 3 dc] twice) all in next ch-3 space; repeat from * twice more; sc between next 2 dtr, sc between dtr and dc, (4 dc, picot, 4 dc) in next ch-2 space, sc between dc and dtr; repeat from * around; join in first sc. Fasten off. Round 6: Join thread in 3rd picot of Round 5; ch 1, sc in picot, * ch 3, sc in next picot, ch 5, sc in next picot, ch 3, pull up a loop in each of the next 3 picots, yo and draw through all 4 loops on hook, ch 3, sc in next picot, ch 5 **, sc in next picot; repeat from * around, end at **; join. Round 7: Ch 1, sc in first sc, * ch 3, sc in next sc, ch 5, hdc in next sc, ch 3, dc in next joined sts, ch 3, hdc in next sc, ch 5 **, sc in next sc; repeat from * around, end at **; join. Round 8: Ch 1, sc in first sc, * ch 3, sc in next space, ch 3, sc in next sc, [ch 3, sc] twice in ch-5 space, ch 3, sc in next hdc, ch 3, sc in next space, ch 3, sc in next dc, ch 3, sc in next space, ch 3, sc in next hdc, [ch 3, sc] twice in ch-5 space **, ch 3, sc in next sc; repeat from * around, end at **; (ch 1, hdc) in first sc to join and form last loop. Rounds 9-17: Ch 1, sc in loop just formed, * ch 3, sc in next ch-3 loop; repeat from * around, ending with (ch 1, hdc) in first sc to join and form last loop. Round 18: Repeat Round 17 ending with ch 3; join in first sc. Round 19: * (Sc, picot, sc) in next ch-3 loop; repeat from * around; join in first sc. Fasten off. Weave in ends. Step 1: Insert satin ball into crocheted piece placing center hole at bottom of crocheted piece on center bottom of ball. Step 2: Weave 18” length of ribbon through Round 15, draw up ribbon very tightly and knot, then tie in bow on top of knot. Trim ribbon ends. Step 3: Insert teardrop pearl corsage pin through ends of 7” length of ribbon and into center top of ball to form hanger loop. Tapestry needle, 1 /8” x 7” double-faced satin ribbon, 2” long pearl teardrop corsage pin; 3” red satin ball. First Half: Ch 12; join with a slip st to form a ring. Round 1: Ch 1, 24 sc in ring; join with a slip st in first sc. Round 2: Ch 10 (counts as dtr, ch-5), skip next sc, [sc in next sc, ch 5, skip next sc, dtr in next sc, ch 5, skip next sc] 5 times, sc in next sc, ch 5, skip next sc; join with a slip st in 5th ch of ch-10. Round 3: Ch 1, sc in same st as joining, ch 8, [sc in next dtr, ch 8] 5 times; join in first sc. Round 4: Ch 1, sc in first sc, * sc in first ch of ch-8, ch 8, skip next 6 ch, sc in next ch **, sc in next sc; repeat from * around, end at **; join in first sc – 18 sc. Round 5: Ch 1, sc in first 2 sc, * sc in first ch of ch-8, ch 8, skip next 6 ch, sc in next ch **, sc in next 3 sc; repeat from * to last sc, end at **; sc in last sc; join – 30 sc. Round 6: Ch 1, sc in first 3 sc, * sc in first ch of ch-8, ch 8, skip next 6 ch, sc in next ch **, sc in next 5 sc; repeat from * to last 2 sc, end at **; sc in last 2 sc; join – 42 sc. Round 7: Slip st in next 3 sc, slip st in next 4 ch, ch 1, sc in same loop, ch 12, * sc in next loop, ch 12; repeat from * around; join in first sc. Round 8: Ch 1, sc in first sc, sc in each ch and sc around; join – 78 sc. Round 9: Ch 1, sc in each sc around; join. Fasten off. Weave in ends. Second Half: Work same as First Half, leaving a 48” thread tail at the end of Round 9 to sew halves together and to make hanger loop. 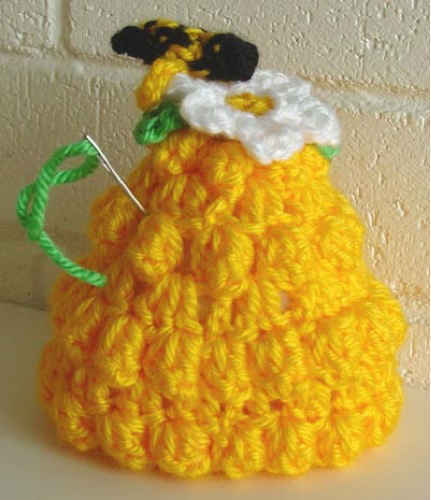 Step 1: Place crocheted halves over satin ball matching crochet design pattern and matching sts. Sew halves together starting at center top of ball with the length of thread that was left on Second Half. Step 2: With remaining thread left after sewing, using crochet hook, anchor the thread with a slip st at center top of ball; ch 40; join to first ch to form loop being careful not to twist ch. Fasten off. Step 3: Open hanger loop at base. Insert teardrop pearl corsage pin into satin ball at center top to give firm hold to hanger loop. Weave in ends. Tapestry needle; 1 /8” x 7” double-faced satin ribbon; 2” long pearl teardrop corsage pin; 3” red satin ball. Round 1: Ch 3 (counts as dc), 23 dc in ring; join with a slip st to top of ch-3. Round 2: Ch 6 (counts as dc, ch 3), skip next dc, [dc in next dc, ch 3, skip next dc] 11 times; join in 3rd ch of ch-6. Round 3: Ch 3, 5 dc in next ch-3 space, [dc in next dc, 5 dc in next ch-3 space] 11 times; join. Round 4: Ch 3, 2 dc in same st as joining, ch 3, skip next 5 dc, [3 dc in next dc, ch 3, skip next 5 dc] 11 times; join. Rounds 5 and 6: Ch 3, dc in next 2 dc, ch 3, [dc in next 3 dc, ch 3] 11 times; join. Round 7: Ch 3, dc in next 2 dc, 3 dc in next ch-3 space, [dc in next 3 dc, 3 dc in next ch-3 space] 11 times; join. Second Half: Work same as First Half, leaving a 48” thread tail at end of Round 7. Step 1: Place crocheted halves over satin ball matching crochet design pattern and matching sts. Sew or slip st together with the length of thread that was left on second half. Step 2: Insert teardrop pearl corsage pin through ends of 7” length of ribbon and into center top of ball to form hanger loop. 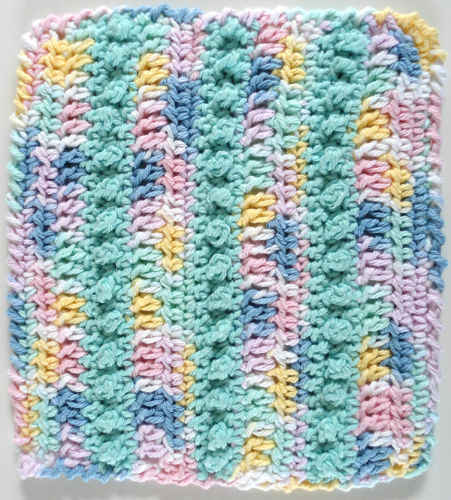 Abbreviations: ch = chain; dc = double crochet; dtr = double treble crochet; hdc = half double crochet; mm = millimeters; sc = single crochet; st(s) = stitch (es); tr = treble crochet; yo = yarn over; * or ** = repeat whatever follows the * or ** as indicated;  = work directions in brackets the number of times specified.